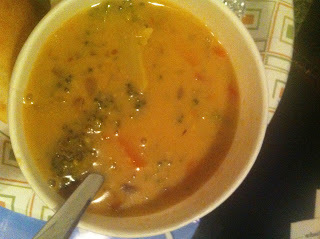 I have a real love for Panera's Broccoli Cheddar Soup. In fact, I get it 99.9% of the time that I go there. It can be 100 degrees out and I will order my soup with a smoked turkey sandwich (or a sierra turkey if I really want to be bad). The calories aren't really that high for the 1/2 portion, but when I moved to Nashville I moved away from Panera. I have one by work, but I really don't have time to get there and it isn't conveniently on my way home (especially now that I have a baby in tow). Anyway, I can safely say that I was having some serious withdrawls. Especially when the fall weather hit, I needed some soup and stat. Enter in Pinterest. Adam helped me whip up this soup and it was seriously so easy and so delicious. We both really enjoyed this and next time I will double the recipe and freeze half. I love that there is no heavy cream involved. And I used skim milk. It was still creamy and perfect with a baguette, a la panera :) the only thing that I had to change was the rue (the water and flour mix) - the soup wasn't thickening up enough so at the end we added in another portion of rue, only less water and more flour - and it thickened up perfectly. So you may have to play around with that, but leave it until the end to see. Sorry for the crap pic, we ate it at night and had no leftover to photograph the next day. Melt the butter in a large soup pot. Add onions, carrots, and celery and saute over medium heat until tender. Add garlic and cook 1 or 2 additional minutes. Add chicken broth and potatoes, bring to a boil, and cook 25-30 minutes. Mix flour with water, add, and simmer until soup is slightly thickened. Add milk and broccoli and cook until broccoli is just tender and soup is heated through. Stir in cheese, allow to melt, and serve.